by Groebner, David F.; Shannon, Patrick W.; Fry, Phillip C.
For 2-Semester Introductory Business Statistics Courses. 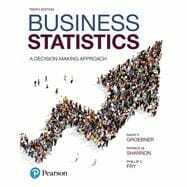 Business Statistics: A Decision Making Approach provides you with an introduction to business statistics and to the analysis skills and techniques needed to make successful real-world business decisions. Written for students of all mathematical skill levels, the authors present concepts in a systematic and ordered way, drawing from their own experience as educators and consultants. Rooted in the theme that data are the starting point, Business Statistics champions the need to use and understand different types of data and data sources to be effective decision makers. This new edition integrates Microsoft Excel throughout as a way to work with statistical concepts and gives you a resource that can be used in both their academic and professional careers. Also available with MyLab Statistics. David F. Groebner is Professor Emeritus of Production Management in the College of Business and Economics at Boise State University. He has bachelor’s and master’s degrees in engineering and a Ph.D. in business administration. After working as an engineer, he has taught statistics and related subjects for 27 years. In addition to writing textbooks and academic papers, Groebner has worked extensively with both small and large organizations, including Hewlett-Packard, Boise Cascade, Albertson’s, and Ore-Ida. He has worked with numerous government agencies, including Boise City and the U.S. Air Force. Patrick W. Shannon, Ph.D. is Dean and Professor of Supply Chain Operations Management in the College of Business and Economics at Boise State University. In addition to his administrative responsibilities, he has taught graduate and undergraduate courses in business statistics, quality management, and production and operations management. In addition, Dr. Shannon has lectured and consulted in the statistical analysis and quality management areas for more than 20 years. Among his consulting clients are Boise Cascade Corporation, Hewlett-Packard, PowerBar, Inc., Potlatch Corporation, Woodgrain Millwork, Inc., J.R. Simplot Company, Zilog Corporation, and numerous other public- and private-sector organizations. Shannon has co-authored several university-level textbooks and has published numerous articles in such journals as Business Horizons, Interfaces, Journal of Simulation, Journal of Production and Inventory Control, Quality Progress, and Journal of Marketing Research. He obtained B.S. and M.S. degrees from the University of Montana and a Ph.D. in statistics and quantitative methods from the University of Oregon. Phillip C. Fry is a professor in the College of Business and Economics at Boise State University, where he has taught since 1988. Phil received his B.A. and M.B.A. degrees from the University of Arkansas and his M.S. and Ph.D. degrees from Louisiana State University. His teaching and research interests are in the areas of business statistics, supply chain management, and quantitative business modeling. In addition to his academic responsibilities, Fry has consulted with and provided training to small and large organizations, including Boise Cascade Corporation, Hewlett-Packard Corporation, the J.R. Simplot Company, United Water of Idaho, Woodgrain Millwork, Inc., Boise City, and Intermountain Gas Company.